FULTON – Oswego County Opportunities Head Start Program will host its annual Community Literacy Night featuring the author Eric Carle. This event will take place at Head Start centers throughout the county on April 27. Parents encouraged to read to their child every day. 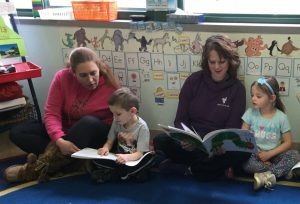 Pictured reading Eric Carle books are Michelle Mulholland with her son, Chase, and Janna Weisbrod with her daughter, Harper. Hands-on literacy activities are planned for children ages three to seven. These exciting activities are based on Eric Carle books, such as The Very Hungry Caterpillar, The Grouchy Lady Bug, The Very Busy Spider and more. All families will receive one Eric Carle book (while supplies last) and each child will enjoy a theme related snack. Discovery Learning Center, 80 County Route 59, Phoenix – 6 – 7:30 p.m.
Oswego Center, Fort Ontario, Building 31, 45 Schuyler St., 5:30 – 7 p.m. The Head Start program was established in 1965. 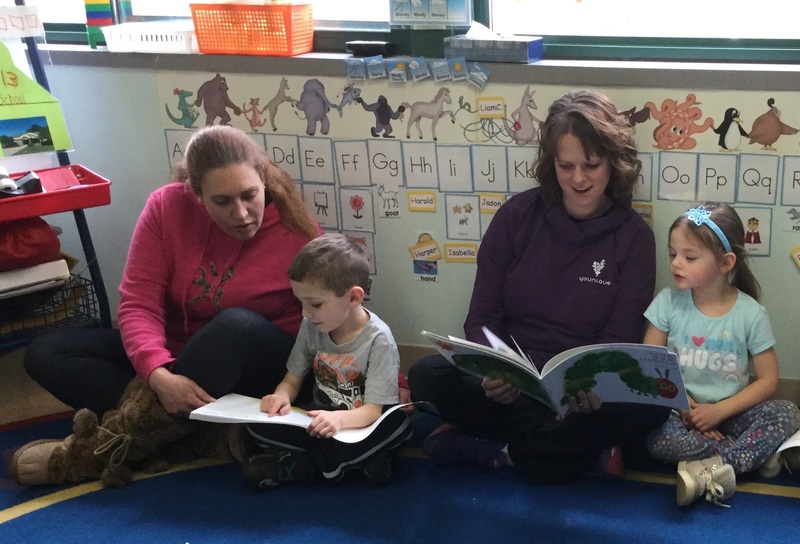 OCO Head Start serves 3- and 4-year-old children at eight centers throughout Oswego County. The program is provided at no cost to families that meet the federal income guidelines. Head Start provides comprehensive services which promotes school readiness through hands-on learning experiences. The children receive nutritious meals and snacks as well. Staff includes teachers with Master’s or Bachelor’s degrees in education, teaching assistants, classroom aides, family specialists, cooks and nurses. Those interested in learning more about Head Start for enrollment, please call 315-598-4711 and toll free at-1-800-359-1171 or visit www.oco.org.